On Thursday 2nd May 2019, Ed is standing in the local/council election, as the Green Party, for the ‘ward’ (zone) called ‘Hunslet and Riverside’ – formerly known as ‘City and Hunslet’. This election is to choose one of our THREE city councillors to represent our area in the Civic Hall, and to work with residents on local issues. WHERE/WHAT IS HUNSLET AND RIVERSIDE? The council ward of ‘Hunslet and Riverside’ was formerly called ‘City and Hunslet’ – but was far too big, so has been rejigged. The main difference is that we’ve lost most but not all of the city centre, and Holbeck ‘Urban Village’. Beeston Hill (the northern side of Cross Flatts Park, around Tempest Road) – as far west as Beeston Road. So, as well as the terraced area around Tempest Road, it includes the Greenmounts, Waverleys, Disraelis, Bismarcks, Greenhouse, Northcotes, and everything in between. Then it gets a bit fiddly! As mentioned, we’ve lost large swathes of the city centre, compared to the previous ‘City and Hunslet’ ward. But the following areas are still ‘ours’..! If in any doubt as to which ward you’re in, get in touch, and we’ll sort you out. 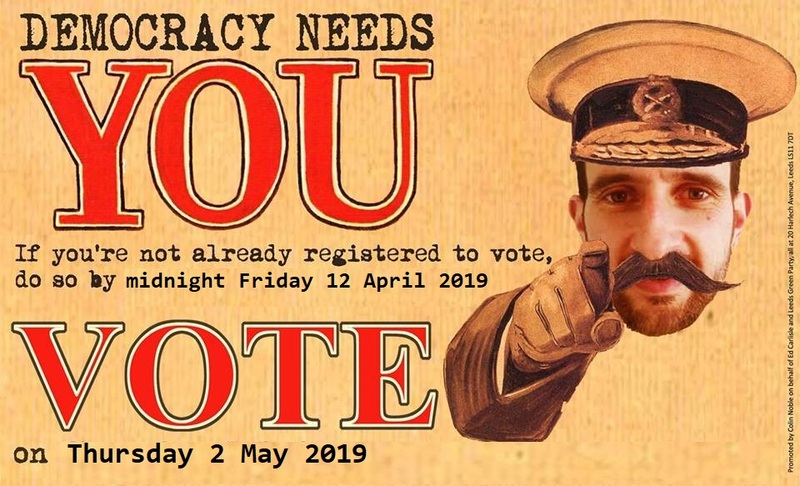 You can also register to vote by post (the deadline for which is Monday 15th April 2019: click here to find out more, or get in touch for help). In that case, you’ll get your polling card + full instructions in the post two weeks before the election – then you’ll need to post your vote or drop it into Leeds Town Hall (or some of the polling stations take them too) by 10pm on election day. The election is on Thursday 2nd May 2019. Put the date in your diary! Polling stations will be open between 7am and 10pm. We will list them all on here beforehand. You’ll be sent a polling card in the post telling you which polling station to go to – but note that you DON’T need you polling card to vote. Just pitch up and give them your name and address. You’ll then be given a voting slip. It will have a list of names on it, including Ed Carlisle’s, with a Green Party logo next to it – if you think I merit your vote! The votes will be counted the night of the election, and the results will be announced then.